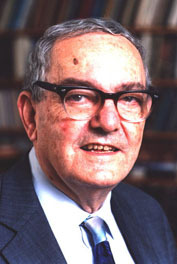 Welcome to the full-text digital archive of Herbert Simon, winner of the 1978 Nobel Prize in Economics. Simon earned an international reputation as one of the founders of artificial intelligence. Dr. Simon's research extended from computer science to such areas as cognitive psychology, administration and economics. Access the Simon Collection containing publications, reports, teaching materials, lectures, correspondence and more. Explore the scope and content notes of the entire Herbert Simon Collection. Learn about Simon's background, those who influenced his life and work, his collaboration with Allen Newell, and other interesting information. The roots of artificial intelligence (AI) are revealed. The pioneering work of professors Herbert A. Simon and Allen Newell inspired advancements in cognitive theory and computer science worldwide. Visit other sites with tributes, bibliographies, and related information about the life and work of Herbert Simon.